Supernatural takes 8 working days to film an episode. Production runs Monday to Friday. If Episode 1 starts on a Monday, the last day of filming is the following Wednesday and Episode 2 starts filming on Thursday. Production schedules are fairly rigid for a variety of reasons. Locations must be arranged in advance and permits are needed; guest cast, regular cast, directors and crew must be scheduled. Standard contracts require cast and crew be paid even if production is cancelled. Each day production is running has fixed overhead costs. Jared mentioned in a Convention Q&A that their contracts require that the actors not take the last flight of the day when returning to Vancouver if they're filming the next day. Apparently they can get special permission to violate this rule (he was doing it for this con) but in general even returning from LA for the weekend they have to take an earlier flight than the last one of the day to avoid the risk of them not getting back to Vancouver in time to film the next day. A normal season has 22 episodes a year. Season 3 was shortened to 16 episodes because of the writers strike; Seasons 7-11 were extended to 23 episodes by the network. Production begins around the beginning of July and finishes around the end of March. Episodes take 8 weekdays to shoot but that is either 10 or 12 or more calendar days counting Saturdays, Sundays, single day holidays, and longer breaks at Thanksgiving and Christmas. The episodes are aired once a week, so production must start in the middle of the summer to stay ahead of the broadcast schedule even with breaks between airing groups of episodes. Holidays from shooting may include the first Monday of August (British Columbia Day), the first Monday of September (Labor Day), the second Monday of October (Canadian Thanksgiving), the 11th of November (Remembrance day), the entire 4th week of November (US Thanksgiving), 2-3 weeks at the end of December/Jan (Christmas, Boxing Day, New Years), the second Monday of February (Family Day, starting in 2013), and the Friday before Easter (Good Friday) if it falls before the end of shooting. There is not much public information about the shooting schedule for the early seasons of Supernatural so most dates are based on fan reports, dates encoded in on-set photos, and educated guesses. In later seasons the crew, guest actors, and directors started tweeting during production. Some directors (e.g. Guy Bee) have tweeted pictures of Call Sheets which include 'Day N of 8' along with the date, which makes it definitive when they were shooting. For the first 2/3rds of Season 9 location manager Russ Hamilton was tweeting daily shooting times which was great, but he was apparently told to quit. The starting time for shooting each day varies depending on when specific locations are available, if shooting at night, or what time filming ended the day before. Standard contracts include specific requirements for overtime/bonus pay if cast and crew are required to work more than a specific number of hours in one day, more than 5 days in a row, or have less than a specific number of hours between the end of one work day and the start of the next. Supernatural doesn't seem to film on weekends nor violate the rest time rules between shooting days, but they do frequently run late on shooting days. To avoid violating the rest period rules, the call times (when crew and actors have to begin work) are often early on Mondays and then if the shooting day doesn't end on time the next day's call times are pushed back (are later). If the call times move back a few hours later each day (a fairly common occurrence, although perhaps not as frequently on Supernatural as on other shows), Friday's call times can be in the afternoon. 'Fraturday' is a common industry slang term for a Friday shooting day that starts so late it doesn't end until the early hours of Saturday morning. This interview with producer Jim Michaels talks about him joining Supernatural in Season 5, and how long the shooting days were at that time. He said he put a stop to the really long days and said he allows nothing more than 14 hours now (which is still a very long day!) because people needed to have lives outside of work and it was unsafe for folks to drive home from work so tired. Each episode is directed by a different person. The director generally arrives in Vancouver about a week before their episode is scheduled to begin shooting. They scout filming locations, meet with all the department heads to make choices on wardrobe, sets, props, special effects, stunts, etc. Then they have 8 days of filming, and afterwards they have post-production where they work with the editor on putting the shots together into the finished product, and work with the music editor and video special effects folks. Some directors only work on a single episode, others might do 3-4 episodes over the course of a season. The episode numbers below are all based on the original broadcast schedule airing. Where noted, some episodes were shot out of order, so the production numbers may differ. Some were switched after shooting, but some were intentionally shot out of order because of the availability of locations, or because Jensen was directing and needed to shoot first to have preparation time. Filming on the pilot was early in 2005. Filming for the rest of the season started in July 2005. Filming ended in early April 2006. 1.01 Feb/Mar 2005 Exif data on promo pics... The scene on the bridge where Dean and Sam argue was filmed approx. 3/9/05. Scene in motel room ('no chick flick moments') was filmed approx. 3/17/05. There is also footage from filming the episode in an early interview that shows the date on the director clapboard to be 3/15/05 (this scene appears to be the struggle between Sam and Dean in Sam's apartment early in the episode). . Also Jared at 1st Paleyfest talked about the time gap between the pilot and next ep. At Vancon 2014 Jared said they started working on the Pilot in Feb 2005. 1.18 Early-Mid Feb 2006 No promo pics or fan reports – just a rough guess based on info from episodes before and after. Filming started on 12 July 2006. Filming ended in early April 2007. 2.01 12 Jul - approx 21 Jul 2006 It was announced that filming on season 2 was starting on July 12. During the commentary for this episode, Jared said that they filmed the scene with Sam and Bobby at Bobby's junkyard as one of the first on the 12th. Exif data from promo pics showing Sam with John in John's room, pics showing Sam over Dean's bed (the “We were just starting to be brothers again” scene), and pics showing John talking to Dean at the end show dates of 7/17/06, 7/19/06, and 7/20/06, respectively. Finally, a quick clip from the season 2 gag reel show the opening scene in the episode with the three Winchester guys in the beat up Impala (and Jensen is grinning widely with his eyes bugging out) shows a clapboard with the date 7/21/06 on it. Also see Supernatural Scrapbook 2006. 2.05 Approx 28 Aug - 7 Sep 2006 There is Exif data on fan pics that show the date of 8/28/06. Also fan/location reports dated 9/2/06. Exif data on promo pics showing the scene early on in the Roadhouse have date of 9/7/08. 4 Sep was Labor Day holiday. 2.22 Late Mar - 5 Apr (approx) 2007 Blogger's set visit was on 3/29/07 while they were filming this episode. Blogger mentioned they were filming the opening scene where Dean is talking to Sam's corpse. Exif data on pics of the boys taken during this set visit have the date 3/29/07. Exif data on promo pics from the final scene in the cemetery have the date 4/3/07. Friday, 6 Apr was the Good Friday holiday this year. Filming started on 17 July 2007. Filming probably ended sometime early in April 2008. The Writers Guild of America strike began Monday, November 5, 2007, and ended February 26, 2008. As the strike began, scripts which were already written were allowed to be filmed, but no new writing could be done. After the strike, new scripts had to be written before filming could begin. Supernatural was able to produce 4 episodes after the strike and before the end of the shooting season. 4 episodes is 32 filming days, or a bit over 6 weeks. 3.02 27 or 30 Jul - 7 or 8 Aug 2007 Exif data on promo pics show the date 30 July. There is a fan report with dated 7 Aug that mentions a restaurant being used as a diner, and the scene with Sam and Ruby is mentioned. Possibly no shooting on 6 Aug (Civic Holiday). 3.07 Late September 2007 This fan report of watching filming for this episode happened on 26 Sept and 28 Sept.
3.11 2007 Filmed after 3.12 but airing order swapped since Jus in Bello was considered to be a better episode to lead into the expected hiatus because of the WGA strike. 3.12 Dec 2007 Last episode written before writers strike. See Supernatural Scrapbook 2007. Filming started in July 2008. Filming probably ended in April 2009. Both boys did movies over the summer hiatus between Seasons 3 and 4. Jensen did a 3D remake of My Bloody Valentine, and Jared did a remake of Friday the 13th. The movies had their premiers in Jan and Feb 2009 respectively, and the boys had to do publicity and attend the screenings in LA. Kim Manners died 25 Jan 2009. 4.01 Early July 2008 Clapboard from the season 4 gag reel include a scene from this ep dated 8 July 2008. 4.04 2008 Last episode directed by Kim. 4.05 Early Aug 2008 Clapboards from the season 4 gag reel includes scenes from this episode dated 2 and 5 Aug 2008. 4.12 Nov 2008? Production takes all of the week of (American) Thanksgiving off. 4.15 Dec 2008 or Jan 2009? Production takes roughly 2 weeks off for the Christmas/New Years holidays. 4.16 Jan 2009? Jensen was in LA for his movie premier (My Bloody Valentine 3D) Thurs 8 Jan. Mike Rohl directed both eps 4.16 and 4.18 which is unusual unless the eps were shot out of order. Typically directors don't have repeat episodes closer than 4-5 eps apart. The director usually has a week of prep work (shot prep, location scouting, technical prep for costumes, sets, etc) before shooting a episode, and then additional work a week or two after shooting to supervise editing, sound, etc. Perhaps Kim was scheduled to direct one of these and Mike filled in. 4.18 Early Feb 2009 This fan report said on Mon 9 Feb Jensen filmed all day on this episode, while Jared was in LA for his movie premier (Friday the 13th remake). It also says the crew were wearing small black buttons with KM on them. 4.19 Early Feb 2009 Clapboard from season 4 gag reel dated 9 Feb 2009 in hotel room from this ep. Filming started on 2 July 2009. Filming probably ended in early April 2010. The 2010 Winter Olympics were in Vancouver in February 2010, so access to various filming locations was impacted. The 100th episode of Supernatural was 5.18, filmed in February 2010 and first aired in April 2010. 5.03 24 Jul 2009 5 Aug 2009  Monday, 3 Aug 2009 holiday. 5.12 6 Nov 2009 18 Nov 2009 Wed, Nov 11 Holiday? 5.14 8 Dec 2009 17 Dec 2009 best guess. Production shuts down for Xmas vacation. 5.16 12 Jan 2010 21 Jan 2010 something off here. 5.17 21 Jan 2010 1 Feb 2010 Start date confirmed. 5.18 2 Feb 2010 11 Feb 2010 best guess. Episode 100. A 100th episode party was thrown on 30 Jan. Filming started on 30 June 2010. Filming probably ended 29 March 2011. Quite a bit of uncertainty about when eps filmed around (American) Thanksgiving and Xmas. There are several overlapping dates and wrong numbers of shooting days. 6.02 Fri, 23 Jul 2010 Wed, 4 Aug 2010  In this Comic Con interview with Jared, he says they were filming day 2 of episode 3. Since 6.04 was filmed first, this fits if he meant the third episode to be filmed. The interview was probably done on the weekend of Sat/Sun, July 24th/25th. No filming Mon, 2 Aug for BC Day holiday. 6.04 Wed, 30 Jun 2010 Mon, 12 Jul 2010 Directed by Jensen; filmed first so he could prep. 6.05 Fri, 27 Aug 2010 Wed, 8 Sep 2010 Filmed after 6.06. No filming Mon, 6 Sept for Labor Day holiday. 6.06 Tues, 17 Aug 2010 Thurs, 26 Aug 2010 Filmed before 6.05. According to Russ, swap was combination of location availability and cutting vampire script down to fit under budget. 6.09 Fri, 1 Oct 2010 Wed, 13 Oct 2010 Location manager Russ told tour folks there was no filming on Canadian Thanksgiving, which is the second Monday in October, so 11 Oct this year. (guess) No filming Thurs, 11 Nov for Remembrance Day holiday. (guess) Location manager Russ told tour folks that production takes the entire week of US Thanksgiving off (4th Thursday in November - 22 Nov to 26 Nov this year). (guess) Production closes for Xmas vacation. (guess) Unsure about when they broke for xmas vacation and whether they started 6.15 before or not. 6.17 Thurs, 3 Feb 2011 Mon, 14 Feb 2011 Originally intended to be 6.18; filmed second. 6.18 Tues, 25 Jan 2011 Thurs, 3 Feb 2011 Originally intended to be 6.17; filmed first. ?25 Jan shared, 3 Feb shared. 6.21 Mon, 7 Mar 2011 Tue, 15 Mar 2011 ? something wrong here, only 7 shooting days. possibly 2nd unit working on the 16th for this ep? (guess) Jensen said on 13 Mar 2011 at the Second Paley Festival that the finale would start shooting on Wednesday, which is 16 Mar. But something wrong here because this is 10 days. 8 days would end on Fri, 25 Mar. Filming started on 6 July 2011. Filming ended on 19 April 2012 (well, early in the AM on 20 April). 7.01 Mon, 18 Jul 2011 Wed, 27 Jul 2011 Confirmed by . Second episode to be filmed. 7.02 Thurs, 28 Jul 2011 Tues, 9 Aug 2011 Confirmed by . Third episode to be filmed. No filming on Monday, 1 Aug for BC Day holiday. 7.06 Thurs, 1 Sep 2011 Tues, 13 Sep 2011  No filming Mon, 5 Sept for Labor Day holiday. 7.09 Thurs, 6 Oct 2011 Tues, 18 Oct 2011 Canadian Thanksgiving Holiday 2nd Monday October, Guy Bee tweets of call sheets for Day 1, Day 5 and Day 8. (guess)  On the Season 7 commentary for Death's Door, Jim Beaver says they filmed the flashbacks/memories of Bobby hunting in the woods with Sam and Dean at the same time they were filming ep 7.09, so they didn't have to go back to the woods. This is only 7 shooting days. Perhaps they overlapped enough with the previous ep, or they shot with 2 units on the 28th? 7.12 Wed, 9 Nov 2011 Fri, 18 Nov 2011  Production has entire (American) Thanksgiving week off. Sunday, 11 Nov was the Remembrance Day holiday, not clear if filming got a day off. (guess)  ?Dec 7 in both this and next? shooting with 2nd unit? (guess) Fri, 16 Dec 2011  Production closes for Christmas/New Year's vacation. (guess)  Starting in 2013 the second Monday of Feb is a holiday for Family Day; this is 9 days unless production got Mon, 13 Feb off as a holiday in 2012. (guess)  ? something wrong here, this is 10 days. 7.20 Mon, 5 Mar 2012 Wed, 14 Mar 2012  In an interview in the Supernatural: Official Magazine with director Johnny MacCarthy, he says they only had access to the building that was used for SucroCorp's headquarters at night and on the weekend. So they filmed all the daylight scenes on Sunday (which would have had to be either 4 Mar or 11 Mar) and then overnight on 2 other nights to get the footage they needed. 7.22 Tues, 27 Mar 2012 Thurs, 5 Apr 2012 Tweets from director Guy Bee of call sheets for Day 1 and Day 8. 6 Apr was a holiday for Good Friday this year. Filming started on 9 July 2012. Filming ended on 22 April 2013. Because 8.03 was filmed first, the production numbers for the first three episodes were not the same as the airing order. The one labeled 8.01 for production aired as 8.03, production 8.02 was 8.01 (the season premiere), and production 8.03 aired as 8.02. This tweet from crew member Janet McCairns joked about the crew confusion with the first three episode numberings. 8.01 Thurs, 19 July 2012 Mon, 30 July 2012 18th was last day filming date of 8.03 (see 8.03 notes). 31st was first filming date of 8.02 (see 8.02 notes). 8.02 Tues, 31 Jul 2012 Fri, 10 Aug 2012 Start date confirmed by a tweet from Kevin Parks. 6 Aug is a British Columbia holiday (B.C. Day), confirmed by a tweet from Tara Larsen, and a tweet from Clif Kosterman. A tweet from Russ Hamilton confirms Wednesday, 8 Aug is day 6 of 8. 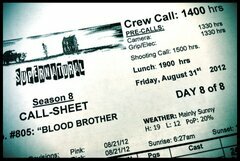 8.03 Mon, 9 Jul 2012 Wed, 18 Jul 2012 Jensen directed again. His episodes film first so he has time to do prep, but this was the third episode of the season. There were several tweets from the first day of filming, including a tweet from Kevin Parks, a tweet from Russ Hamilton, a tweet from Jim Michaels, and a tweet from Tara Larsen. Ending filming date was tweeted by Kevin Parks. 8.04 Mon, 13 Aug 2012 Tues, 21 Aug 2012 Computed days from end of 8.02 to start of 8.05. Because of the very different shooting style of this episode, apparently they took only 7 days for this ep. 8.05 Wed, 22 Aug 2012 Fri, 31 Aug 2012 This tweet from Director Guy Bee said he would start shooting on the 22nd. Guy tweeted a photo of the Day 1 of 8 call-sheet on Aug 22nd. (The call-sheet says shooting start time for Day 1 is noon and "lunch" is at 5pm.) Kevin Parks tweeted it was Day 6 on Wed, 29 Aug. Tara Larsen posted a tweet on Friday, 31 Aug that it was the last day for this episode. Guy tweeted another photo of the Day 8 of 8 call-sheet on the Aug 31st (with a shooting start time for Day 8 of 3:00pm and "lunch" at 7pm). 8.06 Tues, 4 Sep 2012 Thurs, 13 Sept 2012 Monday 3 Sept was a holiday for Labor Day. Tara Larsen tweeted on Tuesday 4 Sept that they were starting shooting. Another tweet from Tara Larsen said 13 Sept was the last day of shooting for this episode. 8.07 Fri, 14 Sep 2012 Tues, 25 Sept 2012 This tweet from someone at the Dallas convention on 23 Sept says Jared said they have two more days to film on this ep, which would make the last day 25 Sept. This tweet from Amanda Tapping said the 21st Sept was her first shooting day. Jensen told a story at the Dallas Con about the wind machines used in the scene when he got out of purgatory and that it was shot on 17 Sept.
8.08 Wed, 26 Sep 2012 Fri, 5 Oct 2012 Assuming an 8 day shooting schedule. This tweet from Jim Michaels on 3 Oct says that at the end of today they are 1/3 of the way through shooting season 8. 23 episodes * 8 days - 1 for the strange schedule of 8.04 (7 days apparently, or overlapped shooting) means the season has 183 shooting days, and 1/3 is 61 days completed. That would make Oct 3rd be day 6 of 8 for this episode. This tweet from Jim Michaels said they are going to be working with Mike Farrell. This tweet from Tara Larsen contains a photo of the episode number (8.08) along with the episode title. 8.09 Tues, 9 Oct 2012 Thurs, 18 Oct 2012 Second Monday in Oct (8 Oct) is Canadian Thanksgiving. On 17 Oct Jim Michaels said in a tweet that they were shooting 8.09. 8.10 Fri, 19 Oct 2012 Tues, 30 Oct 2012 doing the math with 8 day shooting schedule and no breaks. Several tweets during this time mentioned scouting and casting for the next episode (8.11). 8.11 Wed, 31 Oct 2012 Fri, 9 Nov 2012 This tweet from Jim Michaels confirms 31 Oct was the first day of shooting this episode. Guest star Felicia Day (@feliciaday) tweeted on Halloween (the first day) and again on 5 Nov that she was working on her episode. (from Mon, 26 Nov) This tweet from Jared confirmed Tues 13 Nov was day 1 of ep 12. Several tweets from Kevin Parks mention the long weekend (Mon 12 Nov was a holiday), and a tweet from Clif confirmed they are taking all of (American) Thanksgiving week off (19-23 Nov this year). So for this episode, 4 days were before the break, 4 days after. A tweet on Monday, 26 Nov from Jerry Wanek confirmed they were back at work. 8.13 Wed, 12 Dec 2012 Fri, 21 Dec 2012 Episodes 8.13 and 8.14 were shot out of order (8.14 first) so tweets relating to this and the next episode can be confusing. The production numbers are different from the airing order numbers (which is what is listed here.) Several tweets about Fri 21 Dec being the last filming date before the Holiday break, including this one at 3 mins past midnight from Russ Hamilton. This tweet from Werner ten Hoeve (@wern_r) and surrounding tweets talk about the visual effects they are doing for this episode and about the reverse in the order. This tweet from Jim Michaels said they had unexpected snow in the episode directed by Phil Sgriccia, which confirms this episode was shot after ep 8.14. 8.14 Fri, 30 Nov 2012 Tues, 11 Dec 2012 This episode was shot before 8.13 but aired as 8.14. This tweet from Tara Larsen on 30 Nov said it was the first day of the new episode and contains a photo of director Kevin Parks. This tweet from Jim Michaels said it's Day 1 of the next episode. Another tweet from one of the crew with a slate marking Scene 1 of the episode. In this tweet and this followup tweet producer Jim Michaels said they've never shot the opening scene of the episode as the first shot of the first day before. (Scenes are generally filmed out of order for time, availability of locations or actors, etc.) This tweet on Mon, 3 Dec said they're shooting Day 2. This tweet on Tues, 11 Dec said they were shooting the last day of this ep. 8.15 Tues, 8 Jan 2013 Thurs, 17 Jan 2013 This tweet from Russ Hamilton said Tues 8 Jan was the first day of 8.15. Both Js went to the People's Choice awards in LA on Wed 9 Jan. Kevin Parks tweeted early (6am) on Fri 11 Jan that it was going to be a Fraturday, so apparently they made up for the lost filming time for the PCAs. This tweet on Wed 15 Jan from Clif said the boys were getting over the flu. Jared's voice is noticeably lower in several scenes. 8.16 Fri, 18 Jan 2013 Tues, 29 Jan 2013 This tweet from Russ Hamilton said Fri 18 Jan was the start of 8.16. 8.17 Wed, 30 Jan 2013 Fri, 8 Feb 2013 Doing the math from start of ep 8.16 to start of ep 8.18. This video of Jensen (with Jared in the car) backing down the street to reset for the next shot, was filmed 5 Feb.
8.18 Tues, 12 Feb 2013 Thurs, 21 Feb 2013 Second Monday in Feb is a BC holiday. This webpage says Jensen said they had a 3 day weekend with Monday off. Tweet from Russ Hamilton on Tues 12 Feb said this was Day 1 of this ep. This tweet from Jim Michaels on Tues 12 Feb said there were 47 more shooting days in this season after today. That would be 8 days * 5 eps left, plus 7 more days on this ep. 8.19 Fri, 22 Feb 2013 Tues, 5 Mar 2013 The photo in this tweet from the director of 8.19 shows in the small print that shooting on this episode starts Fri 22 Feb. Several tweets by the director confirm the dates. This tweet confirms Tues, 5 Mar is Day 8 of 8. The Harlem Shake video was filmed during the shooting of this episode. 8.21 Mon, 18 Mar 2013 Wed, 27 Mar 2013 This tweet from the (spoiler) director says 27 Mar is the last day of his episode. 8.22 Thurs, 28 Mar 2013 Tues, 9 Apr 2013 Production has Good Friday off if Easter happens before the end of filming. In 2013 that's Friday, 29 March. Author S.E. Hinton was visiting the set during the filming of this ep. Her tweets and pics are storified here by @Superwiki. 8.23 Wed, 10 Apr 2013 Mon, 22 Apr 2013 Jim Michaels said at the Con in Rio 2012 that the CW asked for 23 episodes again in Season 8. The Season 8 Wrap party was Saturday night, 13 Apr 2013. Many tweets and pics from the party, storified here by @Superwiki. This tweet from Russ Hamilton says Monday 15 April is Day 4 of shooting this episode, but that the last day of filming would be Monday, 22 April, which would mean 9 shooting days on the season finale. This tweet from Russ on Monday, 22 April, says it's the last filming day. This tweet (and the rest of the twitter conversation) from Kevin Parks says the last filming date for the J's was Thursday, 18 April. Misha and the rest of the cast and crew filmed until Monday. Filming started on 11 July 2013. Filming ended on 25 April 2014. Supernatural was renewed for Season 9 on Monday, 11 Feb 2013. On 6 June 2013 producer Jim Michaels confirmed with this tweet that Season 9 would again have 23 episodes. Because of wanting to spend time with his family Jensen has said he didn't want to return from hiatus early to direct the first episode to be shot. He said he is still interested in directing but because of the prep work it would be hard to do during the season. It might be possible for him to direct right after a break - like at Christmas - although one suspects he still might prefer more family time. According to the BC Film Commission website for production schedules of TV shows and movies filming in Vancouver, Supernatural's 9th season will be shooting from 11 July 2013 to 24 April 2014. This tweet from one of the crew (and another by Jim Michaels) both say there are 184 shooting days in this season. That's 23 episodes times 8 days each. Figuring out filming dates had been dead easy this year, up until February, because Russ Hamilton, aka @Russ_MOVIEGOD on twitter, had been tweeting the crew call and camera wrap times for each day of filming, along with the episode number and date. No detective work needed. Apparently he was told to stop, so the last 7 eps of the season needed other clues, and was complicated by the filming of the spinoff pilot, including filming days in Chicago. 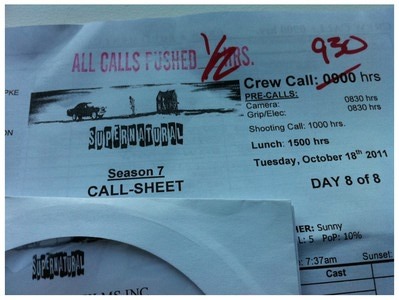 9.02 Thurs, 11 Jul 2013 Mon, 22 Jul 2013 Supernatural started filming Season 9 on the 11th of July, confirmed by this tweet from the (spoiler) director, and source 1, source 2. On 25 June location manager Russ Hamilton tweeted about his first day of prep for Season 9. @Superwiki storified it here. Several tweets, including ones from Jim Michaels confirm that the first episode to be shot will NOT be the season premiere. (This tweet from Serge confirms episode 9.02 was shot first, 9.01 second.) Jared, Jensen, and Misha went to San Diego Comic Con 2013, including a Supernatural Panel on Sunday, 21 July source. This tweet from Jared on Friday, 19 July shows him at the San Diego Zoo, and this tweet says Warner Brothers surprised him with a Birthday cake at the WB Party Friday night. Misha was also at Comic Con on Friday (see this tweet with him and John Barrowman). This tweet (at 3am! Fraturday) from the director confirms Friday was day 7 of 8, and that they continued filming anyway without 'the boys' (which implied Jensen left Vancouver early, too, although he wasn't seen in San Diego on Friday.) This tweet confirms Monday 22 July was Day 8 of 8 and includes the (spoiler) episode name. It is production number 9.01, but will air as episode 9.02. 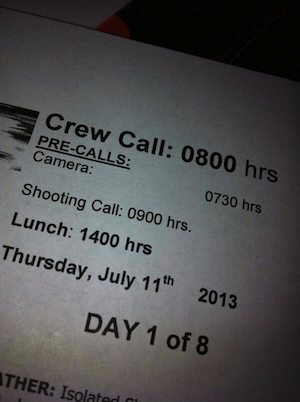 9.03 Fri, 2 Aug 2013 Wed, 14 Aug 2013 No filming on 5 Aug (British Columbia Day holiday, first Monday in Aug), confirmed by this tweet from Tara Larsen. 2 Aug there were two crews filming - first unit on 9.03, second unit did a day 9 on 9.01. 9.04 Thurs, 15 Aug 2013 Mon, 26 Aug 2013 Tweets from Russ Hamilton confirms start of ep on the 15th, end on 26 Aug.
9.05 Tues, 27 Aug 2013 Fri, 6 Sept 2013 Multiple tweets from crew about start date. No filming on Mon, 2 Sept (Labor Day holida). Tweet by the director that Friday, 6 Sept was day 8. 9.06 Mon, 9 Sept 2013 Wed, 18 Sept 2013 Tweet from Kevin Parks confirms 19 Sept first day of 9.07, tweets from Russ. 9.07 Thurs, 19 Sept 2013 Mon, 30 Sept 2013 Tweet from Kevin Parks, tweets from Russ Hamilton. 9.08 Tues, 1 Oct 2013 Fri, 11 Oct 2013 Tweet from Russ Hamilton confirms 3 Oct is Day 3 of this episode. Other tweets from Russ say there was a day 9 of shooting on this episode, on Friday 11 Oct at the same time 9.09 started. 9.09 Fri, 11 Oct 2013 Wed, 23 Oct 2013 Tweets from Russ Hamilton confirm that Day 1 of 9.09 started on Friday while another unit was filming a Day 9 of 9.08. No filming Monday, 14 October (Canadian Thanksgiving holiday). 9.10 Thurs, 24 Oct 2013 Mon, 4 Nov 2013 Daily filming time tweets from Russ Hamilton. 9.11 Tues, 5 Nov 2013 Fri, 15 Nov 2013 No filming Monday, 11 Nov (Remembrance Day holiday). Daily filming time tweets from Russ Hamilton. (from Mon, 2 Dec) Days 1-5 were 18 nov to 22 nov, then the entire following week off for American Thanksgiving, leaving days 6-8 for the first week of Dec. Russ tweeted that Thurs, 21 Nov, was exactly 1/2 of the way through filming Season 9 (shooting day 92 of 184). Russ tweeted that there was a Day 9 for this ep, so 5 Dec had filming for both this and the following episodes. 9.13 Thurs, 5 Dec 2013 Mon, 16 Dec 2013 This tweet from Kevin Parks confirms the 16th was the last filming day of this ep. (from Tues, 7 Jan) This tweet from writer Robert Berens confirms they shot the first 4 days of this ep before the Xmas break, and will finish in Jan. The Xmas break is usually about 2 weeks. A tweet from Russ says they start filming again on 7 Jan.
9.15 Thurs, 23 Jan 2014 Mon, 3 Feb 2014 This tweet from producer Jim Michaels says they filmed ep 16 before 15 for scheduling reasons. 9.16 Mon, 13 Jan 2014 Wed, 22 Jan 2014 Russ Hamilton is again tweeting call and wrap times. Filmed before 9.15. (guess) No filming Mon, 10 Feb (Family Day holiday). Various tweets about the director of this ep. Apparently Russ got told not to tweet details of filming times anymore, so it's back to sleuthing for the rest of this season. (guess) Fraturday on 28 Feb/1 March. Tweet from writer on 10 March (ok, 11 March at 12:14 AM) about being on set for filming. (guess) Thurs, 20 Mar 2014 Additional filming by J2 in Chicago 25-27 March (fan reports) for this episode. (guess) Start date confirmed by a tweet from the director about the start of his episode. This instagram image was posted 4 April about the filming of 9.21, but it doesn't indicate what date the photo was taken. 9.22 Wed, 2 Apr 2014 Fri, 11 Apr 2014 This tweet from the director says Friday, 4 April is Day 3 of 8, which confirms the episode start date. These tweets from Serge and the episode director, confirm Friday 11 April was the end of filming for this episode. 9.23 Mon, 14 Apr 2014 Fri, 25 Apr 2014 No filming on Fri, 18 Apr (Good Friday holiday). This tweet from one of the crew confirms Monday 14 April was the start of filming the season finale. This tweet from Russ on 21 April said there were 4 more shooting days left after Monday. This tweet from Russ on Friday, 25 April confirms this is the last shooting day of season 9. There was an earlier tweet from Jim Michaels which said Thurs, 24 April was day 184 of 184, and that seems to be the boys last filming day (tweet from Jared Thurs night, fan report of Jensen flying home on Friday), but they did continue to film on Friday, 25 Apr until 3:22am (Saturday), according to this tweet from Russ. Also, Kevin Parks confirmed Friday filming in this tweet. If they did film on Monday, 21 April (which could have been a holiday for Easter), that would make Thursday Day 8, and Friday Day 9. The Season 9 wrap party was Saturday night, 26 April, with many tweets from the crew including Jim Michaels, Russ, Adam Williams and many others. Filming started on 8 July 2014. Filming ended on 21 April 2015. Supernatural was renewed for a 10th season on 13 February 2014. The first episode aired in the US on Tuesday, 7 October 2014. Episode 10.05 was the 200th episode of Supernatural, shooting in August 2014 and airing in November 2014. Jensen directed again this season. His episode filmed first but aired as 10.03. 10.01 Fri, 18 July 2014 Tues, 29 July 2014 J&J were at the TCA (Television Critics Association) Press Tour in LA on Friday, 18 July. It was announced by this tweet from publicist Suzanne Gomez @Chico6. Misha and Mark Sheppard didn't come because they were filming that day, according to this tweet. All four of the Season 10 regular cast members (Jensen, Jared, Misha, Mark S.) were at a panel in Hall H at the San Diego Comic Con on Sunday, 27 July. 10.03 Tues, 8 July 2014 Thurs, 17 July 2014 Jensen directed this episode. They filmed it first so he had the week before filming to do prep, but the ep will air third. Many tweets about first day of filming on the 8th, including this one from location manager Russ Hamilton, and this one from Jared. This tweet from Kevin Parks confirmed that filming on this ep finished on the 17th. 10.04 Tues, 12 Aug 2014 Thurs, 21 Aug 2014 This tweet from Camera Operator Brian Rose (@Steadistar) on Wed, 13 Aug, says they are shooting this episode. 10.05 Fri, 22 Aug 2014 Wed, 3 Sept 2014 Filming of Supernatural's 200th episode!! No filming on Monday, 1 Sept (Labor Day holiday). The Salute to Supernatural Vancouver 2014 convention was in Vancouver on 22-24 Aug. Jared sent this tweet with a fan appreciation and marking the starting day of episode 200. This tweet from Jensen (@JensenAckles) (finally he has a twitter account!) marks 3 Sept as the last shooting day of episode 200. 10.09 Wed, 8 Oct 2014 Mon, 20 Oct 2014 No filming Monday, 13 Oct (Canadian Thanksgiving holiday). Start of filming confirmed by this tweet from director Guy Bee. End of filming confirmed by this tweet from Kevin Parks. Jared tweeted that lots of executives were on set during the filming of this episode. They were in town for the 200th episode party in Vancouver. 10.10 Tues, 21 Oct 2014 Thurs, 30 Oct 2014 Dates computed from the previous ep end and next ep start. 10.11 Fri, 31 Oct 2014 Wed, 12 Nov 2014 Starting date confirmed by this tweet (director spoiler) from Kevin Parks. No filming Tues, 11 Nov (Remembrance Day holiday). The boys and Misha were in LA on Tuesday, Nov 4th, for the 200th Fan Appreciation Party. Mark Sheppard was in Vancouver shooting, according to this tweet. (from Mon, 1 Dec) Starting date confirmed by this tweet (director spoiler) from the director's wife. Friday 21 Nov is day 7 of 8. Production usually takes the week of American Thanksgiving off, leaving day 8 for 1 Dec. As in recent years, one of the local crew is directing this episode so an LA director doesn't have to fly back in for one day of filming after the break. Last day of filming on 1 Dec confirmed by this tweet from the director. 10.13 Tues, 2 Dec 2014 Thurs, 11 Dec 2014 This tweet from Kevin Parks confirms 3 Dec was day 2 of 8 for this episode. (Also that his dog Kuma might be in a shot - which turned out to be true. Photo evidence in this tweet.) On 9 Dec Jensen tweeted this pic of the Croissookie. (from Tues, 6 Jan) Production usually takes 2 weeks off at Christmas/New Years. After the break often the production folks start on Monday and filming doesn't begin until Tuesday. This tweet from Russ Hamilton confirms that Monday 5 Jan was a prep day and filming of day 7 of 8 of this episode began on Tues, 6 Jan. Also, this tweet from production assistant Jason Fischer confirms 7 Jan is Day 8 of 8. (guess) This tweet from Jim Michaels on 15 Jan 2015 says it was Day 5 of episode 10.15. Yet, this tweet from Jason Fischer confirms that 12 Jan is day 115 of the season, which would be Day 3 of Episode 15. Either Jim is off by a day, or perhaps they filmed past midnight, or there was a day off from filming between the 12th and 15th that they made up later somehow. This tweet from Jim Michaels celebrated that they were starting filming at 9:00am on a Friday, which meant no late filming on a Friday night (no 'Fraturday'). This tweet from Jason Fischer says they were working on both eps 16 and 17 on 30 Jan. Either day 8 or 9 for ep 16. (guess) No filming on Mon, Feb 9th (Family Day holiday in BC). Several of the crew tweeted about the day off from work. Start of this episode confirmed by this tweet from Kevin Parks. This tweet from production person Jason Fischer says they were shooting second unit scenes for episode 18 and main unit scenes for episode 19 on 24 Feb. This tweet from Jason Fischer implies that 24 Feb is the first day of this episode. Ending date confirmed in this facebook post by Jared. The finale was filmed first, so the last day of the season is at the end of filming this episode. Last day of filming confirmed by many tweets, including this one from Serge, and this one from Jason Fischer. (guess) The finale was filmed before ep 22, according to tweets from Jim M, and Jared at SeaCon. This meet and greet report from SeaCon (warning: spoilers for guest star name) says the order swap was to accommodate the guest's schedule. No filming on Fri, 3 April (Good Friday holiday). On Thurs, 9 Apr, Russ Hamilton sent this tweet saying they were filming with two full units on this day, and by doing the math he confirmed that Tues, 21 April is the last day of filming. Supernatural was renewed for a 11th season on 11 January 2015. Filming began 7 July 2015 and ran through 19 April 2016. 11.01 Fri, 17 July 2015 Wed, 29 July 2015 This ep was filmed second. This tweet and replies to questions about it say they'll finish this ep on the 29th with second unit filming. This tweet explains that some episodes go an additional 2nd unit day over the normal 8 shooting days. 11.02 Wed, 29 July 2015 Mon, 10 Aug 2015 No filming 3 Aug for a holiday. This ep was filmed third. 11.03 Tues, 7 July 2015 Thurs, 16 July 2015 This tweet mentions the start of filming. It will be shot first because Jensen is directing, which gives him time to do the week of Prep while he isn't acting in another episode. This tweet from Jason Fischer (in production) confirms Tuesday, 7 July, as the first day of filming for Season 11. This tweet also from Jason says the 16th was Day 8. 11.04 Tues, 11 Aug 2015 Thurs, 20 Aug 2015 This set of Storified Tweets - Warning, Spoilers - includes tweets from before shooting, to a tweet saying they started shooting on the 11th. The last twitter picture was posted on the 21st but presumably was taken a day earlier. (guess) This tweet by Jason Fischer on 24 Aug shows the board with shooting day 34 of 184. Day 1 of this episode would be shooting day 33, which confirms they started on 21 Aug. This tweet by Jim Michaels on 17 Sept says they're currently shooting episode #225. This tweet by Jim Michaels confirms filming of this ep started on 25 Sept.
(guess) No filming Monday, 12 Oct (Canadian Thanksgiving holiday) Tweet from Serge saying Friday was Day 3 of this episode. (guess) This tweet from Serge said Oct 30th was the first day of this ep. This tweet from Jason shows Nov 6th was during the shooting of this ep. Mon, 30 Nov 2015 No filming Wednesday, 11 Nov (Remembrance Day holiday). First 7 days shooting before a week break for American Thanksgiving. That leaves day 8 for Monday, 30 Nov. This tweet from Jason shows the 30th was during the shooting of this ep. Tweet from Cliff of the call sheet shows Monday, 7 Dec 2015 is day 5 of 8. This tweet from Jim M. says Dec 3rd is day 100 of 184 shooting days for this season. This tweet from Jason shows Dec 8th is during this ep. Tues/Wed 5-6 Jan 2016 Jared tweeted that the 16th was his last day of filming before Christmas break. Jason Fischer tweeted that the 18th was the last day of all filming before break. In another tweet he said that the office reopened on Mon, 4 Jan and filming would start the next day. This tweet from Jason Fischer shows both a main and second unit working, and the board still says shooting ep 11.16 on the 29th of Jan. Confirmed indirectly by the starting date of ep 19. At Nashcon (28 Feb) Jared said they were filming ep 19 now. (Spoiler warning -- each tweet from the director has a pic from the episode.) Tweets from the director says 24 Feb is Day 2, 26 Feb is Day 4, and 3 Mar is the Day 8 (last day) of this episode. (guess) This tweet from camera operator Brian Rose confirms 4 Mar is Day 1 of this episode. This tweet from Serge confirms Mon, 7 Mar is day 2 of this ep. This facebook post by Jared says he just finished filming Day 1 of this episode and it was posted on May 7th, but I believe the post was delayed or it was his first shooting day on this episode. (guess) No filming on Fri, 25 March (Good Friday holiday). This tweet from Jason Fischer of the shooting board confirms filming episode 21 on Mar 18, 2016. (guess) Thurs, 7 Apr 2016 This tweet from Jason Fischer of the shooting board confirms filming episode 22 on Mar 30, 2016. This tweet from Jason Fischer still shows ep 22 in the upper corner on 7 April. (see notes) At the start of Season 11 several tweets mentioned that the CW had ordered 23 episodes again for this season, and Jim Michaels confirmed it. This tweet from Jim Michaels confirmed 8 April was Day 1 of the Season 11 finale. This tweet from Tammy Barker confirmed Tues, 19 Apr 2016 was the last day of filming for Season 11, also this tweet from Emily Swallow (the Darkness), and this tweet from production person Jason Fischer. The photo in this other tweet from Jason Fischer might hint that they have 2 units filming today (the "2nd" with a time below it might be the call time for the 2nd unit). This tweet with photo from Misha Collins says Jensen, Jared and he filmed their last season 11 scene together on Mon, 18 Apr. This tweet from Jared on Saturday night thanked a restaurant for their Season 11 Wrap dinner. This tweet from Jensen sounds like he had scenes until the last day. This tweet from Kevin Parks at 1:00am on Wed, 20 April says they are finished and there are 82 days until Season 12! (This tweet from Jim Michaels says the same thing - 82 days!) This other tweet from Jim M. announces the official camera wrap at 11pm on Tues, 19 April 2016. This tweet From Jim M. says they still had 2nd unit filming on Wed, 20 April. Several tweets including this one, this one, and this one show the crew wrap party was Wed night, 20 April 2016. This tweet of Jensen and this tweet from Jared show they left Vancouver before the crew wrap party. Supernatural was renewed for a 12th season on 11 March 2016. According to whatsfilming.ca, filming for season 12 is scheduled to run from 12 July 2016 to 26 April 2017. This tweet from Jim Michaels in early July 2016 said they'd have 23 episodes again for Season 12, but at the Television Critics Association (TCA) press conference for the CW in August 2016 it was announced that several shows, including Supernatural, would only have 22 episodes this year. Jim said via Twitter that 22 eps would be news to them, so this discrepancy remains unresolved as of 12 Aug 2016. Production people were back in the office already as of 21 June 2016 (according to this tweet). 2 tweets at the end of Season 11 said they had 82 days from the end of Season 11 to the start of Season 12. The following series of tweets are all from production person Jason Fischer. This tweet shows 12 July as shooting day 1 for Season 12. This tweet shows the 21st as day 8 of 8 for episode 1. This tweet said they had a main unit and second unit filming on the 21st. This tweet on Tuesday 19 July says day 5 (should be day 6), and the only response to a question about it was this tweet saying 'good eyes'. Probably the picture was taken on Monday and posted on Tuesday, because Thursday was definitely day 8 (tweet posted on Thurs showing day 8 of 8). (guess) No filming Monday, 1 Aug for BC Day holiday. (guess) No filming Monday, 5 Sept for Labor Day holiday. Vancon was the weekend of Aug 27-28 and several people posted stories and pictures in the days afterwards of watching them filming on location, including who was directing. This confirms they were working on Ep 5 during this time (based on a tweet from Jim Michaels saying the director's episode number). (guess) First and third days of filming confirmed by this and this tweet by the (possible spoiler) director of this episode. (guess) Episode 250. An instagram post by Jensen confirms the 13th is the first day of this episode, which is also the broadcast day of the season premier in the US. or Tues, 6 Dec 2016 (?) Assuming no filming the week of Nov 21-25 for American Thanksgiving. This tweet by Serge Ladouceur on 28 Nov says it is Day 3 of ep 12. At the SF convention on 4 Dec, Jensen said he had one day of filming this week and then he could go back to Austin to be with family including his new twins. or Fri, 16 Dec 2016 This tweet by Serge Ladouceur on 12 Dec says it is Day 4 of ep 13, which would mean Day 8 is Friday, 16 Dec. But if filming started on Tuesday, then Monday should be day 5? (guess) Computed back from ep 17 dates. need independent confirmation. Day 1 tweet from Frida Norrman confirms start of filming for this ep. Second Monday of Feb is holiday for Family Day. Supernatural was renewed for a 13th season on 8 January 2017. This page was last edited on 21 June 2018, at 12:07.